Hello internet! We’re taking a breather from botany this week and focusing on the practical. Today is January 29, 2016 and I bet you know what that means. No, not National Corn Chip Day, this blog is proudly independent of the corn chip cartels that seek to dominate this great nation. No, right now we’re at the height of the tree pruning season! From late December to early March trees are, dormant, sleeping though the winter and waiting for the onset of spring to start growing. With that in mind here are the things you need to know to prune your young tree properly! Pictured: What you will not be doing by following our pruning methods. Seriously this is the worst. Before we begin, pruning can be a delicate and potentially dangerous task for you and your tree. We'll be reviewing the basics of pruning but please contact Our City Forest or your local urban forestry non-profit and see if they can provide you with assistance! Also check in with your local municipalities regarding pruning ordinances. Some cities manage trees and it may even be illegal to prune the trees in front of your house. At the risk of repeating myself, now is the time to prune. Most trees are sleeping through the winter, conserving their energy for spring and summer. While they’re dormant the trees transfer their sap in their roots. Any cuts you make to the tree will heal faster because they’ll start healing as spring arrives. Winter also means fewer insects, fungi and tree diseases are active so there’s less chance that the pruning wound will be colonized by pests. Trees also need pruning in order to grow properly. So give your tree some TLC and prune with me today. Damaged branches should be removed before any other pruning is done. Alright so now that your winter blood is boiling and you’re raring to prune you’re probably wondering where to start. As a good steward you don’t want to hurt your tree and that’s good! We’re happy you care so much. The first step should satisfy your tree-oriented parental instincts because we’re removing the 4-5 Ds. If you see any Dead, Dying, Diseased, or Decaying, branches remove them. It’s that simple. If you don’t know if a branch is dead, simply scratch the bark and look for a green layer. Remember the cambium? That’s what that is. If you see it the branch is alive and well. Establish a Glorious Central Leader! Now that the tree is free of dead or diseased branches you want to make sure the tree grows with a strong structure. To do that you need to select a “central leader”. The central leader should be the tallest, straightest, healthiest stem in line with the rest of the trunk. Sometimes it can be difficult to decide on a central leader. In that case just use your best judgement. Incidentally the top of the central leader will hold the apical meristem that directs the growth of the tree. To establish the leader, identify any competing branches that are higher and thicker than the leader or angled too closely to the trunk and remove them. If you’ve ever lived in a city you know that trees get hit by cars, pedestrians and other things. It’s an unfortunate side effect of bad drivers and basic human error. Fortunately, you can help prevent this by pruning a tree to have ample clearance over sidewalks and streets! The lowest permanent branch should be 14 feet over a street and eight feet over a sidewalk and no more than half as thick as the trunk. It should also be growing away from the trunk or other hazards. Growing toward the trunk leads to included bark and weakness. If you have lower branches that are thicker than that you’re inviting structural problems, large breaks in bad weather, or for the tree to be pushed over in a collision. Cutting away a branch with included bark that's growing just slightly too close to the sidewalk will save this tree from damage and tearing. So now that you’ve identified the lowest permanent branch look above it toward the central leader. Follow the leader down the tree and examine the branches in the canopy. If the branches are too close together they’ll grow into each other as they age. (Too close meaning 12” on small trees and 18” on large trees). Clip branches that are too close together. Leave the larger, stronger branch behind. There also shouldn’t be any more than 3 branches coming from any one point. Sometimes you need extra reach to clip crossing or close branches in the canopy. Look for branches that cross over each other and either remove them or take them back to a different terminal bud. If you’ve got lots of little twigs, don’t worry, those don’t typically survive and don’t need pruning. This kind of pruning prevents future damage, included bark and allows more light into the canopy. Remember your lowest permanent branch? How could you forget? The lowest permanent branch is like the name of your child or social security number, unforgettable and important. Take a look at those branches below your lowest permanent branch. If any of those branches are larger than 1/3rd the width of the trunk you should remove them. Branches lower than the lowest permanent branch that exceed 1/3 of the trunk's width should be removed. Big branches should be cut with a saw using the above method to avoid damaging the tree. Smaller branches should be pruned back to three or four buds. If you see any suckers, shoots growing from the base of the tree, remove them. It’s important that you don’t remove all of the temporary branches from the tree. Doing so will make the young tree too top heavy and produce an unattractive “lollipop” shape. Small, temporary branches also assist the growth of the tree by drawing water and nutrients up the trunk and protect the trunk from sun damage. Congrats you’ve finished pruning! If you’ve done it correctly your tree should have a graceful, natural shape. You've avoided the horrible mistake of topping your trees, dooming them to weak structure, injury, damage and insect attack. Tree topping has the added benefit of looking hideous in addition to nearly killing your tree. The ultimate goal of pruning is to prune the tree without looking like the tree has been pruned. 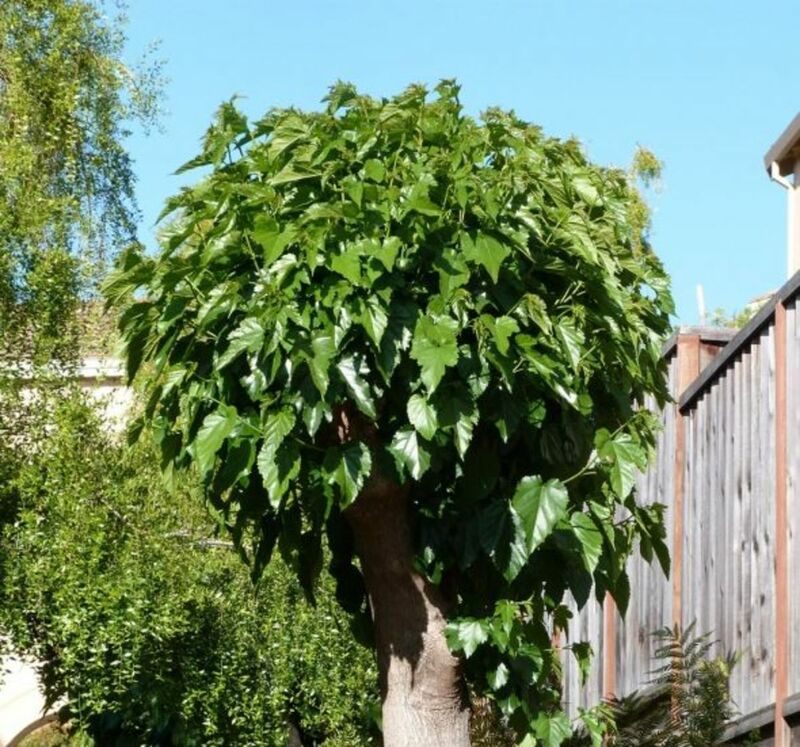 Unlike topping or pollarding, which create unsightly scarring, weak growth and stress the tree, our pruning method ensures stable, strong, healthy trees. If you have a large, mature tree, please consider hiring an ISA Certified Arborist to manage the pruning process. Doing large trees is dangerous and carries far more risk to the tree and the pruner. If you've enjoyed our blog please consider volunteering on one of our planting projects or at our nursery. Monetary contributions are also welcome. Your support helps Our City Forest keep Silicon Valley green and environmentally friendly. As always thank you for your continued support and readership.